Handling your increased production for seamless, temperature-controlled delivery to the milk hauler. Robotic dairies have been around for nearly twenty years now, and this progressive method of milk harvesting has slowly taken a strong hold on the industry. The first dairy producers who stepped out of the norm have now lived through several years of automated milking. Their experiences are now encouraging growth: more cows, more robots, and another Mueller milk cooler. If you are thinking four or more robots then you need to be thinking two Mueller milk coolers. Multiple milk coolers have several benefits, and milk quality is at the top of the list. With two milk coolers there is no need to rush the milk hauler sampling or reduce wash time. The milk sampling and milk cooler wash are among the most crucial variables to your milk quality and your wallet. The alternative is rushing through the milk sampling procedures and skimming time off the wash cycles in efforts to prevent the buffer tank from overflowing. A second milk cooler removes the timeline from that process. Dual milk coolers also helps automate your milk house and allows for a more flexible pick-up schedule for your milk hauler. With Mueller's large robotic cooling control, Nimbus, you can now switch between milk coolers with an adjustable set point based on milk volume and go mobile with your milk house. Stream live milk temperatures and volumes on your smart phone from anywhere you have cellular data access. When milking into multiple Mueller Milk Coolers sharing refrigeration is very important. With the HiPerCool® A5, you remove refrigeration from your milk cooler and place it "up-line" at the Accu-Therm® plate cooler. Milk passes through the plate cooler after being pre-cooled with well water and chilled with glycol water from the HiPerCool A5. Refrigeration at the milk cooler will then maintain a desired low set point to ensure quality product. As dairy producers are thinking long-term and about future growth, you will likely see more robotic dairies worldwide. Robotic dairies allow dairy producers more time for things they are passionate about such as herd health, milk quality, and genetics. This way of life also promotes flexibility in a dairy producer's daily operations and means more quality time with family and friends. 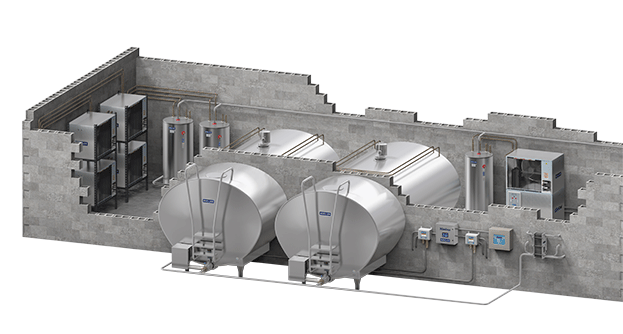 At Paul Mueller Company, we are here to support your efforts with the most efficient milk storage and cooling equipment available. When designing a robotic dairy farm, request to review the right robotic cooling solution with your local milk cooling representative.